11月は仮設でゴスペルフラも大好評でした。DKさんの道真理命をあやさんが丁寧に教えて下さいました。フラに込められた心からのメッセージが私たちの愛する皆さんに届きますように！Another excitement we had at temporary housing this month was Gospel Hula! 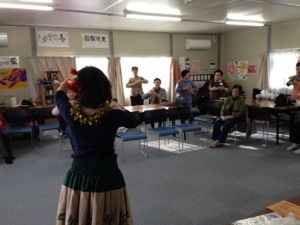 Aya shared her beautiful hula with the music by DK, the way, the truth and the life. Ladies wanted learn more and dance more! Our prayers are dear friends would come to know the hope in Jesus! Hiya, I’m really glad I’ve found this info. Nowadays bloggers publish only about gossips and internet and this is actually frustrating. A good site with interesting content, that is what I need. Thank you for keeping this website, I’ll be visiting it. Do you do newsletters? Can not find it. I have been surfing online greater than three hours lately, yet I by no means discovered any fascinating article like yours. It’s beautiful price enough for me. In my view, if all web owners and bloggers made good content as you did, the net will likely be a lot more helpful than ever before. Thanks for sharing superb informations. Your web-site is very cool. I’m impressed by the details that you have on this website. It reveals how nicely you understand this subject. Bookmarked this website page, will come back for extra articles. You, my pal, ROCK! I found just the information I already searched everywhere and just could not come across. What a perfect web site. I’m usually to running a blog and i actually respect your content. The article has actually peaks my interest. I’m going to bookmark your site and preserve checking for new information. I was very pleased to seek out this internet-site.I needed to thanks to your time for this wonderful read!! I positively having fun with each little little bit of it and I’ve you bookmarked to check out new stuff you blog post. You really make it seem so easy with your presentation however I find this topic to be actually something that I believe I’d by no means understand. It kind of feels too complicated and very broad for me. I’m taking a look ahead to your next put up, I?¦ll try to get the dangle of it! I’m still learning from you, as I’m trying to achieve my goals. I certainly love reading everything that is posted on your website.Keep the tips coming. I loved it! I went over this internet site and I think you have a lot of wonderful info , saved to my bookmarks (:. As I website possessor I think the content here is rattling fantastic, appreciate it for your efforts. naturally like your website however you need to take a look at the spelling on several of your posts. A number of them are rife with spelling problems and I in finding it very bothersome to tell the truth on the other hand I will definitely come back again. You can definitely see your expertise within the paintings you write. The world hopes for even more passionate writers such as you who are not afraid to say how they believe. At all times follow your heart. “Man is the measure of all things.” by Protagoras. Great web site. A lot of useful information here. I¦m sending it to a few friends ans additionally sharing in delicious. And naturally, thank you to your sweat! Thanks for sharing superb informations. Your site is so cool. I am impressed by the details that you have on this site. It reveals how nicely you perceive this subject. Bookmarked this web page, will come back for more articles. You, my friend, ROCK! I found simply the info I already searched everywhere and just couldn’t come across. What a perfect web-site. I really enjoy examining on this web site, it has excellent content. “Don’t put too fine a point to your wit for fear it should get blunted.” by Miguel de Cervantes. Attractive portion of content. I simply stumbled upon your blog and in accession capital to claim that I acquire actually loved account your weblog posts. Anyway I’ll be subscribing on your feeds and even I fulfillment you access consistently rapidly. With every little thing that seems to be building within this area, all your viewpoints are generally very exciting. Having said that, I am sorry, but I do not subscribe to your entire idea, all be it radical none the less. It seems to everybody that your remarks are not entirely rationalized and in simple fact you are yourself not completely certain of the point. In any event I did take pleasure in reading through it. Does your blog have a contact page? I’m having problems locating it but, I’d like to send you an email. I’ve got some recommendations for your blog you might be interested in hearing. Either way, great site and I look forward to seeing it improve over time. I am not really good with English but I find this rattling easy to interpret. You have observed very interesting details! ps nice web site. “The world is dying for want, not of good preaching, but of good hearing.” by George Dana Boardman. I’ve been surfing online greater than three hours as of late, but I never discovered any attention-grabbing article like yours. It’s lovely worth enough for me. Personally, if all webmasters and bloggers made excellent content as you did, the web will probably be much more helpful than ever before. “Revolution is not a onetime event.” by Audre Lorde. An impressive share, I simply given this onto a colleague who was doing just a little analysis on this. And he actually bought me breakfast as a result of I discovered it for him.. smile. So let me reword that: Thnx for the treat! However yeah Thnkx for spending the time to discuss this, I feel strongly about it and love reading extra on this topic. If doable, as you become experience, would you mind updating your weblog with extra details? It’s extremely helpful for me. Massive thumb up for this blog publish! You really make it appear really easy with your presentation however I to find this topic to be really something that I believe I might never understand. It kind of feels too complex and extremely huge for me. I am having a look forward on your subsequent post, I¦ll try to get the hold of it! Awesome blog! Do you have any hints for aspiring writers? I’m hoping to start my own website soon but I’m a little lost on everything. Would you advise starting with a free platform like WordPress or go for a paid option? There are so many options out there that I’m totally confused .. Any tips? Bless you! Usually I don’t read post on blogs, but I would like to say that this write-up very forced me to check out and do so! Your writing style has been surprised me. Thank you, quite great article. I am not rattling wonderful with English but I get hold this very leisurely to translate. Thanks for some other informative web site. Where else could I am getting that type of info written in such a perfect manner? I’ve a undertaking that I am simply now running on, and I’ve been on the glance out for such information. I am usually to running a blog and i actually respect your content. The article has actually peaks my interest. I am going to bookmark your web site and preserve checking for brand new information. F*ckin’ awesome things here. I’m very happy to peer your post. Thank you a lot and i am having a look ahead to contact you. Will you kindly drop me a e-mail? Some genuinely wonderful information, Gladiola I noticed this. Good day! I just would like to give an enormous thumbs up for the great information you’ve got here on this post. I will probably be coming again to your blog for extra soon. I have been browsing on-line more than 3 hours these days, but I by no means discovered any interesting article like yours. It¦s pretty worth enough for me. Personally, if all website owners and bloggers made excellent content as you probably did, the internet can be much more helpful than ever before. Hello There. I discovered your weblog using msn. This is a really smartly written article. I’ll be sure to bookmark it and come back to read extra of your useful info. Thanks for the post. I will definitely comeback. You made some decent factors there. I regarded on the web for the difficulty and found most individuals will go together with together with your website. I’m still learning from you, as I’m trying to reach my goals. I definitely enjoy reading all that is written on your website.Keep the tips coming. I liked it! I do believe all of the ideas you’ve presented on your post. They’re really convincing and can definitely work. Still, the posts are too short for beginners. May you please lengthen them a bit from subsequent time? Thanks for the post. What i don’t understood is actually how you’re not actually a lot more well-appreciated than you might be right now. You are so intelligent. You understand therefore considerably with regards to this subject, produced me personally believe it from a lot of varied angles. Its like women and men aren’t interested until it?¦s one thing to do with Woman gaga! Your own stuffs outstanding. Always maintain it up! Nearly all of what you assert happens to be astonishingly accurate and that makes me ponder the reason why I hadn’t looked at this in this light before. This piece truly did switch the light on for me as far as this issue goes. Nevertheless at this time there is actually 1 factor I am not too comfy with and while I try to reconcile that with the actual central theme of your point, allow me see exactly what the rest of your subscribers have to point out.Very well done. Throughout this awesome pattern of things you actually receive a B- just for effort. Exactly where you lost me personally was first on all the details. As it is said, the devil is in the details… And that couldn’t be more correct at this point. Having said that, let me inform you just what did do the job. Your authoring can be quite powerful and that is probably the reason why I am making the effort to opine. I do not really make it a regular habit of doing that. Secondly, even though I can easily notice a leaps in logic you make, I am not really confident of exactly how you seem to unite your points which inturn help to make the actual final result. For the moment I shall yield to your issue however trust in the future you actually connect the facts much better. A lot of whatever you claim happens to be astonishingly appropriate and that makes me wonder why I had not looked at this in this light previously. This article truly did turn the light on for me as far as this subject goes. Nevertheless at this time there is just one issue I am not necessarily too comfortable with so while I make an effort to reconcile that with the central theme of the point, let me observe exactly what all the rest of your readers have to point out.Well done. I absolutely love your blog and find the majority of your post’s to be just what I’m looking for. Do you offer guest writers to write content for you? I wouldn’t mind writing a post or elaborating on most of the subjects you write about here. Again, awesome blog! I am glad to be one of many visitants on this outstanding site (:, thanks for putting up. Hello, i think that i saw you visited my website thus i came to “go back the favor”.I am attempting to in finding issues to enhance my web site!I assume its ok to use some of your concepts!! I am really inspired together with your writing skills and also with the layout on your weblog. Is this a paid subject or did you modify it your self? Either way stay up the nice high quality writing, it’s uncommon to see a great blog like this one these days.. I conceive this internet site has some very fantastic information for everyone . “As ill-luck would have it.” by Miguel de Cervantes. Thank you for any other magnificent article. Where else may just anyone get that kind of info in such a perfect way of writing? I have a presentation subsequent week, and I’m at the look for such info. Good day I am so delighted I found your website, I really found you by mistake, while I was searching on Digg for something else, Regardless I am here now and would just like to say thanks a lot for a remarkable post and a all round thrilling blog (I also love the theme/design), I don’t have time to read it all at the moment but I have book-marked it and also added your RSS feeds, so when I have time I will be back to read a lot more, Please do keep up the superb job. Dead indited subject matter, thanks for selective information. It is in point of fact a great and helpful piece of info. I am happy that you just shared this helpful information with us. Please keep us up to date like this. Thank you for sharing. Very good written post. It will be helpful to anybody who employess it, as well as myself. Keep up the good work – looking forward to more posts. Some genuinely choice content on this site, saved to my bookmarks. Great – I should certainly pronounce, impressed with your site. I had no trouble navigating through all the tabs and related info ended up being truly simple to do to access. I recently found what I hoped for before you know it at all. Reasonably unusual. Is likely to appreciate it for those who add forums or anything, website theme . a tones way for your client to communicate. Excellent task.. Fantastic web site. A lot of useful info here. I¦m sending it to a few buddies ans also sharing in delicious. And of course, thanks for your effort! I enjoy you because of all of your hard work on this blog. Kate takes pleasure in doing investigation and it’s simple to grasp why. Many of us know all regarding the powerful medium you create simple solutions through the web site and therefore cause participation from others on the point and our own daughter is really being taught a lot of things. Take pleasure in the remaining portion of the year. You are always conducting a remarkable job. Have you ever considered creating an e-book or guest authoring on other sites? I have a blog based on the same ideas you discuss and would really like to have you share some stories/information. I know my viewers would value your work. If you’re even remotely interested, feel free to shoot me an email. Great post. I was checking continuously this blog and I am impressed! Very useful info particularly the remaining part I deal with such info a lot. I used to be seeking this particular info for a very lengthy time. Thanks and good luck. I must express my respect for your kindness in support of men and women that absolutely need help with this concept. Your real dedication to passing the solution all through came to be rather functional and have specifically encouraged employees like me to get to their pursuits. The useful guidelines implies so much to me and substantially more to my peers. With thanks; from all of us. I am only commenting to make you know of the superb encounter my girl went through using your web site. She even learned too many things, which included what it is like to have a wonderful teaching character to get the others really easily have an understanding of specified tricky topics. You actually exceeded her expectations. I appreciate you for coming up with those valuable, safe, explanatory as well as cool guidance on this topic to Emily. Some really nice and utilitarian information on this internet site, besides I think the pattern has got great features. Thanks for sharing excellent informations. Your site is very cool. I’m impressed by the details that you¦ve on this website. It reveals how nicely you perceive this subject. Bookmarked this web page, will come back for extra articles. You, my friend, ROCK! I found just the information I already searched all over the place and just could not come across. What an ideal site. Its such as you learn my thoughts! You appear to know a lot about this, like you wrote the ebook in it or something. I believe that you could do with a few to force the message house a little bit, but instead of that, this is wonderful blog. A great read. I will certainly be back. What¦s Happening i’m new to this, I stumbled upon this I’ve found It absolutely useful and it has helped me out loads. I am hoping to contribute & help different customers like its aided me. Good job. certainly like your web site but you need to check the spelling on quite a few of your posts. A number of them are rife with spelling issues and I in finding it very troublesome to inform the reality then again I will definitely come back again. Hey, you used to write great, but the last few posts have been kinda boringK I miss your great writings. Past few posts are just a little out of track! come on! My husband and i have been so joyful when Chris could finish up his research through your precious recommendations he gained through your site. It’s not at all simplistic to just always be giving freely thoughts that many many others might have been making money from. So we consider we need the website owner to give thanks to because of that. These illustrations you have made, the straightforward website menu, the relationships you will help to foster – it’s got mostly wonderful, and it’s really letting our son in addition to us imagine that this article is awesome, which is certainly highly important. Thank you for the whole lot! A formidable share, I simply given this onto a colleague who was doing just a little evaluation on this. And he actually purchased me breakfast as a result of I discovered it for him.. smile. So let me reword that: Thnx for the treat! However yeah Thnkx for spending the time to discuss this, I really feel strongly about it and love studying more on this topic. If attainable, as you turn into expertise, would you mind updating your blog with extra details? It’s extremely helpful for me. Massive thumb up for this weblog put up! Useful info. Fortunate me I discovered your web site accidentally, and I am surprised why this accident didn’t took place earlier! I bookmarked it. Excellent web site. Lots of useful info here. I am sending it to some friends ans also sharing in delicious. And obviously, thanks for your sweat! I think this website has got some real excellent info for everyone . “When you get a thing the way you want it, leave it alone.” by Sir Winston Leonard Spenser Churchill. wonderful points altogether, you just received a brand new reader. What would you suggest in regards to your put up that you simply made some days in the past? Any sure? Fantastic web site. A lot of helpful info here. I am sending it to several friends ans also sharing in delicious. And naturally, thank you in your effort! With havin so much content and articles do you ever run into any issues of plagorism or copyright violation? My site has a lot of exclusive content I’ve either created myself or outsourced but it appears a lot of it is popping it up all over the web without my authorization. Do you know any techniques to help protect against content from being stolen? I’d definitely appreciate it. you are in point of fact a good webmaster. The web site loading velocity is amazing. It seems that you are doing any unique trick. In addition, The contents are masterpiece. you’ve performed a magnificent activity in this matter! What¦s Going down i am new to this, I stumbled upon this I’ve discovered It positively helpful and it has helped me out loads. I’m hoping to give a contribution & aid other customers like its helped me. Good job. Thank you for sharing superb informations. Your web-site is so cool. I’m impressed by the details that you have on this blog. It reveals how nicely you understand this subject. Bookmarked this web page, will come back for extra articles. You, my friend, ROCK! I found just the information I already searched everywhere and just could not come across. What a perfect web-site. Hello would you mind stating which blog platform you’re working with? I’m going to start my own blog soon but I’m having a difficult time selecting between BlogEngine/Wordpress/B2evolution and Drupal. The reason I ask is because your design and style seems different then most blogs and I’m looking for something completely unique. P.S Sorry for getting off-topic but I had to ask! Utterly composed content, thanks for entropy. “You can do very little with faith, but you can do nothing without it.” by Samuel Butler. Good day very cool blog!! Guy .. Excellent .. Wonderful .. I’ll bookmark your website and take the feeds additionally…I’m glad to find a lot of useful information right here in the submit, we need develop extra techniques in this regard, thanks for sharing. . . . . . Simply want to say your article is as surprising. The clarity in your submit is simply spectacular and i could suppose you’re a professional in this subject. Well along with your permission let me to take hold of your RSS feed to keep up to date with imminent post. Thanks one million and please keep up the rewarding work. You really make it seem so easy together with your presentation however I to find this matter to be actually one thing that I think I’d by no means understand. It sort of feels too complex and very extensive for me. I am looking ahead to your next post, I will try to get the hang of it! What i don’t understood is actually how you are not really much more well-liked than you may be now. You’re very intelligent. You realize thus considerably relating to this subject, produced me personally consider it from numerous varied angles. Its like men and women aren’t fascinated unless it is one thing to do with Lady gaga! Your own stuffs outstanding. Always maintain it up! you’re really a good webmaster. The website loading speed is amazing. It seems that you are doing any unique trick. Also, The contents are masterwork. you have done a fantastic job on this topic! Nice post. I learn one thing more challenging on completely different blogs everyday. It should at all times be stimulating to read content material from different writers and follow just a little something from their store. I’d prefer to make use of some with the content material on my blog whether you don’t mind. Natually I’ll give you a link in your web blog. Thanks for sharing. Thanks for some other informative blog. Where else could I get that kind of info written in such an ideal approach? I’ve a undertaking that I’m just now running on, and I have been at the glance out for such information. I absolutely love your blog and find nearly all of your post’s to be just what I’m looking for. can you offer guest writers to write content to suit your needs? I wouldn’t mind writing a post or elaborating on a few of the subjects you write about here. Again, awesome web site! Useful information. Lucky me I found your web site accidentally, and I’m stunned why this coincidence did not took place in advance! I bookmarked it. Howdy would you mind letting me know which webhost you’re using? I’ve loaded your blog in 3 different web browsers and I must say this blog loads a lot faster then most. Can you suggest a good web hosting provider at a reasonable price? Kudos, I appreciate it! Have you ever considered writing an ebook or guest authoring on other sites? I have a blog centered on the same information you discuss and would really like to have you share some stories/information. I know my subscribers would value your work. If you’re even remotely interested, feel free to shoot me an e-mail. The following time I learn a weblog, I hope that it doesnt disappoint me as much as this one. I imply, I do know it was my choice to read, but I truly thought youd have something fascinating to say. All I hear is a bunch of whining about one thing that you could fix if you werent too busy searching for attention. Wow, amazing blog structure! How lengthy have you been running a blog for? you make blogging look easy. The total glance of your site is magnificent, let alone the content! My brother recommended I might like this website. He was entirely right. This publish actually made my day. You can not imagine just how much time I had spent for this information! Thanks! Hi there very nice site!! Guy .. Beautiful .. Amazing .. I’ll bookmark your web site and take the feeds additionally…I am satisfied to find so many helpful info here in the submit, we want develop extra strategies in this regard, thank you for sharing. . . . . .
Nice post. I used to be checking continuously this blog and I am impressed! Extremely useful information particularly the last section I care for such info a lot. I was seeking this certain information for a long time. Thank you and good luck. I consider something really interesting about your web site so I saved to bookmarks. I?¦m now not certain where you are getting your information, however good topic. I must spend a while learning much more or understanding more. Thank you for wonderful info I was in search of this information for my mission. you’ve gotten an awesome weblog here! would you wish to make some invite posts on my weblog? What i don’t realize is in truth how you are not really much more smartly-appreciated than you might be right now. You’re very intelligent. You know thus significantly in the case of this topic, made me in my view imagine it from numerous varied angles. Its like men and women don’t seem to be interested except it is something to accomplish with Woman gaga! Your individual stuffs outstanding. All the time deal with it up! Magnificent site. A lot of helpful info here. I am sending it to some buddies ans also sharing in delicious. And of course, thank you on your sweat! What i do not realize is in fact how you’re now not really much more well-preferred than you might be now. You are so intelligent. You realize thus significantly in relation to this topic, produced me in my view imagine it from numerous various angles. Its like women and men are not involved except it’s something to accomplish with Girl gaga! Your individual stuffs outstanding. All the time handle it up! I’ve recently started a site, the info you offer on this website has helped me tremendously. Thank you for all of your time & work. “The more sand that has escaped from the hourglass of our life, the clearer we should see through it.” by Jean Paul. I just like the helpful info you supply for your articles. I’ll bookmark your blog and test again right here regularly. I’m slightly sure I will learn a lot of new stuff right right here! Good luck for the next! Whats Taking place i’m new to this, I stumbled upon this I’ve found It positively useful and it has helped me out loads. I am hoping to give a contribution & help other users like its aided me. Good job. Hmm it looks like your site ate my first comment (it was extremely long) so I guess I’ll just sum it up what I had written and say, I’m thoroughly enjoying your blog. I too am an aspiring blog blogger but I’m still new to everything. Do you have any points for first-time blog writers? I’d definitely appreciate it. Keep up the superb work, I read few content on this internet site and I believe that your web blog is real interesting and has lots of fantastic information. Appreciating the persistence you put into your site and in depth information you provide. It’s great to come across a blog every once in a while that isn’t the same old rehashed information. Excellent read! I’ve bookmarked your site and I’m adding your RSS feeds to my Google account. What¦s Going down i am new to this, I stumbled upon this I’ve discovered It positively useful and it has helped me out loads. I’m hoping to contribute & assist different users like its helped me. Great job. It is in point of fact a great and useful piece of information. I am glad that you simply shared this useful info with us. Please keep us informed like this. Thanks for sharing. I really enjoy examining on this web site, it contains wonderful posts. “Beware lest in your anxiety to avoid war you obtain a master.” by Demosthenes. Hola! I’ve been following your weblog for a while now and finally got the courage to go ahead and give you a shout out from New Caney Tx! Just wanted to tell you keep up the excellent job! I would like to thank you for the efforts you have put in writing this web site. I’m hoping the same high-grade web site post from you in the upcoming as well. In fact your creative writing skills has encouraged me to get my own website now. Really the blogging is spreading its wings quickly. Your write up is a great example of it. As I website possessor I think the subject matter here is very excellent, regards for your efforts. What i do not realize is actually how you’re not actually much more smartly-appreciated than you might be now. You are so intelligent. You understand therefore significantly with regards to this subject, made me personally consider it from numerous numerous angles. Its like men and women aren’t interested unless it is one thing to do with Girl gaga! Your individual stuffs great. At all times care for it up! I conceive this website contains very superb written articles blog posts. It?¦s in reality a nice and useful piece of information. I am satisfied that you shared this useful info with us. Please stay us informed like this. Thank you for sharing. obviously like your website however you have to test the spelling on quite a few of your posts. A number of them are rife with spelling problems and I find it very troublesome to inform the reality then again I will surely come back again. Real superb information can be found on site. “Politics is applesauce.” by Will Rogers. You could certainly see your enthusiasm in the work you write. The world hopes for even more passionate writers like you who are not afraid to mention how they believe. At all times follow your heart. A formidable share, I simply given this onto a colleague who was doing a bit of analysis on this. And he actually bought me breakfast because I found it for him.. smile. So let me reword that: Thnx for the treat! But yeah Thnkx for spending the time to discuss this, I feel strongly about it and love studying extra on this topic. If attainable, as you turn into expertise, would you thoughts updating your blog with more details? It’s highly useful for me. Large thumb up for this blog publish! You have remarked very interesting details! ps decent web site. “By their own follies they perished, the fools.” by Homer. It’s in point of fact a great and helpful piece of info. I’m satisfied that you shared this helpful info with us. Please keep us informed like this. Thanks for sharing. Yesterday, while I was at work, my cousin stole my iPad and tested to see if it can survive a forty foot drop, just so she can be a youtube sensation. My iPad is now destroyed and she has 83 views. I know this is entirely off topic but I had to share it with someone! It is in reality a nice and helpful piece of info. I am happy that you just shared this helpful info with us. Please stay us informed like this. Thanks for sharing. you will have a great weblog right here! would you like to make some invite posts on my weblog? Hello.This article was extremely fascinating, especially because I was investigating for thoughts on this matter last Friday. I wish to express appreciation to you for bailing me out of this condition. Because of looking through the the web and getting proposals which are not helpful, I thought my life was gone. Living without the presence of answers to the problems you’ve sorted out by means of your main website is a crucial case, and the ones which could have adversely affected my entire career if I had not noticed your web site. Your good mastery and kindness in dealing with a lot of things was very useful. I’m not sure what I would’ve done if I hadn’t come across such a point like this. I am able to now look forward to my future. Thanks for your time so much for your impressive and amazing guide. I won’t think twice to propose your web site to any individual who would like care about this issue. Hi there! Someone in my Myspace group shared this site with us so I came to look it over. I’m definitely loving the information. I’m bookmarking and will be tweeting this to my followers! Fantastic blog and excellent design and style. Heya i am for the first time here. I found this board and I to find It really helpful & it helped me out a lot. I am hoping to offer something back and help others such as you aided me. I really like your writing style, wonderful info, thank you for posting . “Silence is more musical than any song.” by Christina G. Rossetti. Thanks for some other informative blog. Where else may just I am getting that type of information written in such a perfect manner? I have a project that I am simply now running on, and I have been at the glance out for such info. I wish to express appreciation to you for bailing me out of such a circumstance. Right after checking throughout the the web and finding proposals that were not beneficial, I believed my life was done. Being alive without the presence of approaches to the issues you have fixed by way of this write-up is a crucial case, as well as the ones that could have in a wrong way affected my entire career if I hadn’t discovered the blog. The expertise and kindness in taking care of every part was excellent. I am not sure what I would’ve done if I had not discovered such a point like this. I can also at this moment look forward to my future. Thanks for your time so much for the specialized and amazing help. I won’t think twice to suggest your blog to any person who needs to have guide about this subject matter. I think this internet site has some really fantastic info for everyone. “Variety is the soul of pleasure.” by Aphra Behn. Thanks, I have recently been searching for info about this topic for a long time and yours is the greatest I have discovered till now. But, what about the bottom line? Are you positive about the supply? Really nice style and good written content, hardly anything else we need : D.
I love what you guys tend to be up too. This type of clever work and coverage! Keep up the wonderful works guys I’ve you guys to my own blogroll. Thanks for the good writeup. It in truth was once a amusement account it. Look advanced to more delivered agreeable from you! However, how can we keep up a correspondence? What i don’t understood is in truth how you’re no longer really a lot more smartly-appreciated than you may be now. You are very intelligent. You recognize therefore considerably in terms of this topic, made me personally consider it from a lot of various angles. Its like women and men are not fascinated until it is one thing to accomplish with Woman gaga! Your individual stuffs outstanding. Always deal with it up! Good post. I study one thing more difficult on totally different blogs everyday. It can at all times be stimulating to learn content material from other writers and follow somewhat one thing from their store. I’d want to make use of some with the content on my blog whether you don’t mind. Natually I’ll give you a hyperlink in your web blog. Thanks for sharing. Do you have a spam problem on this blog; I also am a blogger, and I was wondering your situation; we have created some nice practices and we are looking to exchange methods with others, be sure to shoot me an e-mail if interested. Utterly indited subject material, regards for entropy. “No human thing is of serious importance.” by Plato. Awesome blog! Do you have any recommendations for aspiring writers? I’m planning to start my own blog soon but I’m a little lost on everything. Would you suggest starting with a free platform like WordPress or go for a paid option? There are so many choices out there that I’m totally confused .. Any suggestions? Thanks! I like what you guys tend to be up too. This type of clever work and exposure! Keep up the fantastic works guys I’ve incorporated you guys to my blogroll. you’re really a good webmaster. The web site loading speed is incredible. It seems that you are doing any unique trick. Also, The contents are masterpiece. you’ve done a excellent job on this topic! Please let me know if you’re looking for a article writer for your blog. You have some really good articles and I believe I would be a good asset. If you ever want to take some of the load off, I’d really like to write some articles for your blog in exchange for a link back to mine. Please blast me an e-mail if interested. Regards! Have you ever thought about adding a little bit more than just your articles? I mean, what you say is important and everything. But think of if you added some great photos or video clips to give your posts more, “pop”! Your content is excellent but with images and clips, this website could undeniably be one of the best in its field. Excellent blog! My spouse and i were quite ecstatic that Chris could carry out his researching from the ideas he got out of your web site. It’s not at all simplistic to just choose to be giving out methods other people could have been making money from. So we know we need the website owner to appreciate for that. All the explanations you’ve made, the straightforward website navigation, the relationships you can make it easier to create – it is many wonderful, and it is letting our son in addition to the family feel that this issue is thrilling, and that is seriously mandatory. Thanks for all! Howdy! I could have sworn I’ve been to this site before but after reading through some of the post I realized it’s new to me. Anyhow, I’m definitely glad I found it and I’ll be book-marking and checking back frequently! I?¦ve been exploring for a little bit for any high-quality articles or blog posts in this sort of space . Exploring in Yahoo I finally stumbled upon this web site. Reading this information So i?¦m satisfied to convey that I have a very just right uncanny feeling I discovered exactly what I needed. I such a lot unquestionably will make sure to do not fail to remember this site and provides it a look on a constant basis. naturally like your web site but you have to take a look at the spelling on quite a few of your posts. Many of them are rife with spelling problems and I find it very troublesome to inform the reality nevertheless I’ll surely come back again. I truly enjoy reading on this website , it contains great posts. “The secret of eternal youth is arrested development.” by Alice Roosevelt Longworth. Wow, superb blog format! How long have you ever been blogging for? you make running a blog glance easy. The full look of your web site is wonderful, as well as the content! It’s a shame you don’t have a donate button! I’d certainly donate to this superb blog! I guess for now i’ll settle for book-marking and adding your RSS feed to my Google account. I look forward to brand new updates and will talk about this website with my Facebook group. Talk soon! An impressive share, I simply given this onto a colleague who was doing a little evaluation on this. And he in truth purchased me breakfast because I found it for him.. smile. So let me reword that: Thnx for the treat! However yeah Thnkx for spending the time to debate this, I really feel strongly about it and love studying more on this topic. If attainable, as you turn out to be expertise, would you mind updating your blog with more details? It is highly useful for me. Large thumb up for this weblog publish! Hi! I know this is somewhat off topic but I was wondering which blog platform are you using for this site? I’m getting sick and tired of WordPress because I’ve had problems with hackers and I’m looking at alternatives for another platform. I would be fantastic if you could point me in the direction of a good platform. What i do not understood is actually how you are not actually a lot more smartly-appreciated than you might be now. You are very intelligent. You understand therefore considerably on the subject of this subject, made me for my part consider it from so many various angles. Its like men and women aren’t interested unless it’s one thing to do with Girl gaga! Your personal stuffs excellent. Always maintain it up! I wish to express thanks to you for bailing me out of this setting. After checking through the world wide web and obtaining basics that were not helpful, I believed my life was over. Existing devoid of the solutions to the problems you’ve sorted out by way of your entire site is a crucial case, as well as the kind that could have in a wrong way damaged my entire career if I had not encountered your blog post. The expertise and kindness in taking care of all the stuff was helpful. I am not sure what I would’ve done if I had not come across such a point like this. I’m able to at this moment relish my future. Thanks for your time so much for this professional and sensible guide. I won’t be reluctant to endorse your web sites to any individual who requires guide on this subject matter. Fantastic web site. A lot of useful information here. I?¦m sending it to several pals ans additionally sharing in delicious. And naturally, thank you on your sweat! You really make it seem really easy along with your presentation but I to find this topic to be really one thing that I believe I would never understand. It sort of feels too complex and very huge for me. I’m looking ahead in your subsequent put up, I will attempt to get the hang of it! It is the best time to make a few plans for the future and it’s time to be happy. I have learn this submit and if I could I desire to counsel you some fascinating things or tips. Maybe you could write subsequent articles relating to this article. I desire to read even more things approximately it! certainly like your website however you have to take a look at the spelling on quite a few of your posts. A number of them are rife with spelling issues and I to find it very bothersome to tell the reality nevertheless I will definitely come back again. Hi there, just turned into alert to your weblog thru Google, and found that it’s really informative. I’m going to be careful for brussels. I will be grateful if you continue this in future. Lots of people might be benefited from your writing. Cheers! What i do not realize is in reality how you are not really a lot more neatly-liked than you may be now. You are so intelligent. You already know therefore significantly in terms of this subject, produced me in my opinion believe it from numerous various angles. Its like women and men aren’t interested until it?¦s one thing to do with Woman gaga! Your personal stuffs nice. Always deal with it up! An impressive share, I simply given this onto a colleague who was doing slightly analysis on this. And he in fact bought me breakfast as a result of I found it for him.. smile. So let me reword that: Thnx for the deal with! However yeah Thnkx for spending the time to debate this, I feel strongly about it and love reading extra on this topic. If doable, as you become expertise, would you mind updating your blog with more particulars? It’s highly useful for me. Large thumb up for this blog post! That is the suitable blog for anybody who needs to seek out out about this topic. You notice so much its almost onerous to argue with you (not that I actually would need…HaHa). You positively put a brand new spin on a topic thats been written about for years. Nice stuff, simply nice! I¦ve read several just right stuff here. Certainly value bookmarking for revisiting. I surprise how a lot effort you place to make this type of wonderful informative site. You really make it seem really easy with your presentation however I find this topic to be actually one thing that I feel I’d by no means understand. It sort of feels too complex and very vast for me. I am having a look ahead in your subsequent put up, I?¦ll try to get the dangle of it! I believe this website holds very excellent composed content content. Thankyou for this marvelous post, I am glad I detected this internet site on yahoo. obviously like your website but you need to check the spelling on several of your posts. Many of them are rife with spelling problems and I find it very bothersome to tell the truth nevertheless I will certainly come back again. It is truly a great and helpful piece of information. I am happy that you just shared this helpful info with us. Please keep us informed like this. Thank you for sharing. Hello there, I found your blog by way of Google at the same time as looking for a related topic, your web site came up, it appears great. I’ve bookmarked it in my google bookmarks. A powerful share, I simply given this onto a colleague who was doing a little bit analysis on this. And he the truth is bought me breakfast because I discovered it for him.. smile. So let me reword that: Thnx for the deal with! But yeah Thnkx for spending the time to discuss this, I feel strongly about it and love studying extra on this topic. If attainable, as you turn out to be expertise, would you mind updating your weblog with extra details? It is extremely useful for me. Huge thumb up for this weblog post! Some really marvellous work on behalf of the owner of this internet site, dead outstanding articles. obviously like your web site but you need to take a look at the spelling on quite a few of your posts. A number of them are rife with spelling problems and I in finding it very bothersome to inform the truth on the other hand I will definitely come back again. I have been exploring for a bit for any high-quality articles or blog posts on this sort of area . Exploring in Yahoo I ultimately stumbled upon this web site. Reading this information So i?¦m satisfied to express that I’ve an incredibly excellent uncanny feeling I discovered just what I needed. I most undoubtedly will make sure to do not overlook this web site and provides it a look regularly. Thanks , I have recently been searching for info approximately this topic for a long time and yours is the greatest I have came upon till now. However, what about the conclusion? Are you positive concerning the supply? whoah this weblog is wonderful i like studying your posts. Keep up the good paintings! You already know, lots of individuals are hunting around for this information, you could aid them greatly. Thank you for some other informative web site. The place else may I get that kind of info written in such a perfect way? I have a mission that I’m simply now operating on, and I have been on the glance out for such information. Its wonderful as your other content : D, regards for posting. “The rewards for those who persevere far exceed the pain that must precede the victory.” by Ted W. Engstrom. I’m still learning from you, as I’m trying to achieve my goals. I certainly love reading all that is posted on your site.Keep the tips coming. I loved it! My husband and i felt lucky that John managed to deal with his basic research via the ideas he grabbed while using the blog. It’s not at all simplistic just to always be giving for free concepts which usually the rest might have been making money from. We do understand we now have the writer to appreciate because of that. Most of the explanations you have made, the easy website navigation, the friendships you will make it easier to instill – it’s all awesome, and it is aiding our son and us do think the subject is awesome, and that is quite vital. Many thanks for the whole thing! you’re really a just right webmaster. The web site loading pace is amazing. It sort of feels that you’re doing any distinctive trick. Moreover, The contents are masterwork. you’ve performed a great activity on this subject! Once I originally commented I clicked the -Notify me when new comments are added- checkbox and now every time a remark is added I get four emails with the identical comment. Is there any method you can take away me from that service? Thanks! I would like to show my thanks to the writer just for bailing me out of this setting. After exploring throughout the the net and obtaining advice that were not pleasant, I believed my life was over. Existing minus the strategies to the difficulties you’ve solved all through your entire short post is a critical case, as well as ones that could have negatively damaged my career if I hadn’t discovered your web site. Your ability and kindness in dealing with all the details was invaluable. I am not sure what I would’ve done if I had not encountered such a stuff like this. I can also now relish my future. Thank you very much for this impressive and effective help. I won’t be reluctant to recommend your web page to anyone who needs to have direction on this matter. obviously like your website however you need to test the spelling on quite a few of your posts. A number of them are rife with spelling issues and I in finding it very troublesome to inform the truth nevertheless I?¦ll surely come again again. I am not real good with English but I come up this real leisurely to read . Thanks , I’ve just been looking for information about this topic for a long time and yours is the best I have found out so far. However, what concerning the bottom line? Are you positive about the supply? Nice read, I just passed this onto a friend who was doing some research on that. And he just bought me lunch as I found it for him smile Therefore let me rephrase that: Thank you for lunch! “Remember It is 10 times harder to command the ear than to catch the eye.” by Duncan Maxwell Anderson. Outstanding post, I think website owners should learn a lot from this web blog its really user pleasant. of course like your website however you have to take a look at the spelling on several of your posts. Many of them are rife with spelling issues and I to find it very bothersome to inform the reality then again I’ll certainly come again again. Thanks for sharing excellent informations. Your site is so cool. I am impressed by the details that you have on this blog. It reveals how nicely you understand this subject. Bookmarked this website page, will come back for more articles. You, my friend, ROCK! I found simply the info I already searched everywhere and simply couldn’t come across. What an ideal web site. As I website owner I believe the subject matter here is real superb, thankyou for your efforts. I am lucky that I detected this web site, precisely the right information that I was looking for! . I will right away grab your rss as I can’t find your email subscription hyperlink or newsletter service. Do you have any? Please let me know in order that I could subscribe. Thanks. You could certainly see your skills in the work you write. The world hopes for more passionate writers like you who are not afraid to mention how they believe. Always go after your heart. “Until you walk a mile in another man’s moccasins you can’t imagine the smell.” by Robert Byrne. Some really wonderful information, Glad I noticed this. “The only truly affluent are those who do not want more than they have.” by Erich Fromm. Excellent post. I was checking constantly this blog and I am inspired! Extremely helpful information specifically the last part I care for such information much. I was seeking this certain information for a long time. Thanks and good luck. Some truly nice and utilitarian information on this internet site, besides I think the layout has got wonderful features. I’m typically to running a blog and i actually appreciate your content. The article has really peaks my interest. I’m going to bookmark your website and preserve checking for brand new information. I like what you guys are up also. Such smart work and reporting! Carry on the superb works guys I have incorporated you guys to my blogroll. I think it will improve the value of my website . Excellent post. I was checking constantly this blog and I am impressed! Very useful info particularly the last part I care for such information much. I was seeking this certain information for a long time. Thank you and best of luck. I’d incessantly want to be update on new blog posts on this web site, saved to fav! . I have been exploring for a bit for any high quality articles or blog posts on this sort of area . Exploring in Yahoo I at last stumbled upon this website. Reading this info So i am happy to convey that I have an incredibly good uncanny feeling I discovered exactly what I needed. I most certainly will make certain to do not forget this website and give it a glance on a constant basis. Absolutely indited written content, regards for selective information. Some truly howling work on behalf of the owner of this site, dead great written content. you’re in point of fact a just right webmaster. The website loading velocity is incredible. It kind of feels that you are doing any unique trick. Moreover, The contents are masterwork. you’ve performed a great process in this topic! I was looking at some of your articles on this website and I believe this internet site is real informative! Continue putting up. I?¦m no longer certain where you’re getting your information, however great topic. I must spend some time finding out more or understanding more. Thanks for magnificent information I used to be looking for this info for my mission. It is actually a great and helpful piece of information. I’m satisfied that you just shared this useful information with us. Please keep us informed like this. Thanks for sharing. Hi, Neat post. There’s an issue together with your site in internet explorer, could check this?K IE nonetheless is the marketplace chief and a big portion of other people will miss your wonderful writing because of this problem. Thank you for the auspicious writeup. It actually was a entertainment account it. Glance complex to more brought agreeable from you! However, how can we communicate? Hiya, I’m really glad I’ve found this information. Nowadays bloggers publish only about gossips and internet and this is really frustrating. A good website with exciting content, this is what I need. Thanks for keeping this site, I’ll be visiting it. Do you do newsletters? Can not find it. Thanks , I’ve just been searching for info about this topic for a while and yours is the best I have found out so far. However, what about the bottom line? Are you positive in regards to the source? I simply wanted to say thanks again. I’m not certain the things I would’ve taken care of in the absence of the methods shown by you over such a topic. It previously was a very distressing concern for me personally, but taking a look at a skilled tactic you handled that forced me to leap with happiness. Now i’m happy for your assistance and then expect you are aware of a great job you are always doing training the others through the use of your blog post. I am sure you haven’t met all of us. Woah! I’m really enjoying the template/theme of this site. It’s simple, yet effective. A lot of times it’s very hard to get that “perfect balance” between superb usability and visual appearance. I must say that you’ve done a superb job with this. Also, the blog loads extremely fast for me on Internet explorer. Outstanding Blog! I would like to thank you for the efforts you have put in writing this blog. I’m hoping the same high-grade site post from you in the upcoming as well. In fact your creative writing abilities has encouraged me to get my own web site now. Really the blogging is spreading its wings quickly. Your write up is a great example of it. Most of the things you articulate is astonishingly precise and it makes me ponder why I hadn’t looked at this with this light before. This piece truly did turn the light on for me personally as far as this particular issue goes. Nevertheless at this time there is actually 1 position I am not necessarily too comfortable with so whilst I attempt to reconcile that with the actual core theme of the point, permit me see what all the rest of your subscribers have to say.Nicely done. I want to show my appreciation to this writer just for bailing me out of this type of instance. After surfing around throughout the search engines and meeting suggestions that were not beneficial, I believed my entire life was gone. Living without the presence of solutions to the difficulties you’ve solved all through the short post is a critical case, and ones that might have negatively affected my entire career if I had not discovered your web site. Your expertise and kindness in handling the whole thing was excellent. I am not sure what I would’ve done if I had not encountered such a thing like this. It’s possible to at this time look ahead to my future. Thanks for your time so much for your expert and amazing guide. I won’t be reluctant to suggest your web page to anybody who would need assistance on this subject matter. It¦s in reality a great and helpful piece of information. I am satisfied that you just shared this useful info with us. Please keep us informed like this. Thank you for sharing. Thank you for sharing superb informations. Your website is very cool. I am impressed by the details that you¦ve on this web site. It reveals how nicely you understand this subject. Bookmarked this web page, will come back for extra articles. You, my pal, ROCK! I found simply the information I already searched everywhere and just could not come across. What a perfect web-site. I have been exploring for a bit for any high-quality articles or weblog posts in this sort of area . Exploring in Yahoo I ultimately stumbled upon this site. Reading this info So i¦m satisfied to express that I’ve a very good uncanny feeling I found out just what I needed. I so much unquestionably will make sure to do not forget this website and give it a look on a continuing basis. Hey very nice blog!! Man .. Beautiful .. Amazing .. I’ll bookmark your site and take the feeds also…I’m happy to find numerous useful information here in the post, we need work out more strategies in this regard, thanks for sharing. . . . . . Excellent blog! Do you have any recommendations for aspiring writers? I’m planning to start my own site soon but I’m a little lost on everything. Would you recommend starting with a free platform like WordPress or go for a paid option? There are so many options out there that I’m completely confused .. Any recommendations? Thanks! you’re in reality a good webmaster. The website loading speed is amazing. It sort of feels that you are doing any unique trick. Moreover, The contents are masterwork. you’ve done a fantastic job in this matter! I would like to thnkx for the efforts you have put in writing this website. I’m hoping the same high-grade website post from you in the upcoming as well. Actually your creative writing abilities has encouraged me to get my own web site now. Actually the blogging is spreading its wings rapidly. Your write up is a good example of it. Thanks for every other informative site. Where else may I am getting that kind of information written in such a perfect manner? I’ve a mission that I am simply now working on, and I’ve been on the look out for such info. This website is my inhalation, very fantastic pattern and perfect articles. It is really a great and helpful piece of info. I am glad that you shared this useful information with us. Please keep us up to date like this. Thanks for sharing. It?¦s actually a nice and useful piece of information. I am happy that you simply shared this useful information with us. Please stay us informed like this. Thanks for sharing. I would like to thnkx for the efforts you’ve put in writing this website. I am hoping the same high-grade site post from you in the upcoming as well. In fact your creative writing abilities has encouraged me to get my own web site now. Really the blogging is spreading its wings fast. Your write up is a good example of it. I’m still learning from you, as I’m trying to achieve my goals. I definitely love reading everything that is written on your site.Keep the information coming. I liked it! Simply wanna input on few general things, The website pattern is perfect, the content material is really excellent : D.
Some truly nice and useful info on this internet site, besides I conceive the layout holds superb features. I in addition to my buddies were actually viewing the great items from your web blog then before long came up with a horrible feeling I never thanked the site owner for those secrets. All of the young boys happened to be for that reason excited to read all of them and have in effect truly been having fun with these things. We appreciate you turning out to be considerably kind and then for opting for varieties of incredibly good subject areas millions of individuals are really desperate to be aware of. Our sincere apologies for not saying thanks to earlier. Hey there would you mind sharing which blog platform you’re working with? I’m looking to start my own blog soon but I’m having a difficult time selecting between BlogEngine/Wordpress/B2evolution and Drupal. The reason I ask is because your design seems different then most blogs and I’m looking for something completely unique. P.S Apologies for getting off-topic but I had to ask! Hello very cool website!! Man .. Excellent .. Wonderful .. I’ll bookmark your web site and take the feeds alsoKI am satisfied to search out numerous useful info right here within the publish, we want develop extra techniques in this regard, thank you for sharing. . . . . . I adore looking through and I think this website got some genuinely useful stuff on it! . Great awesome things here. I?¦m very happy to see your post. Thank you a lot and i’m taking a look forward to contact you. Will you kindly drop me a mail? I like the helpful info you provide in your articles. I’ll bookmark your weblog and check again here regularly. I’m quite sure I’ll learn lots of new stuff right here! Good luck for the next! Hello there! Quick question that’s totally off topic. Do you know how to make your site mobile friendly? My website looks weird when viewing from my iphone4. I’m trying to find a template or plugin that might be able to resolve this problem. If you have any recommendations, please share. With thanks! What i do not realize is in reality how you are no longer actually a lot more well-liked than you may be right now. You are so intelligent. You know therefore considerably relating to this topic, made me individually imagine it from a lot of varied angles. Its like women and men don’t seem to be fascinated except it’s one thing to accomplish with Girl gaga! Your individual stuffs great. All the time deal with it up! Its like you read my thoughts! You seem to understand so much approximately this, such as you wrote the e-book in it or something. I feel that you just can do with a few to pressure the message house a bit, but other than that, that is wonderful blog. An excellent read. I’ll certainly be back. Hmm it looks like your website ate my first comment (it was super long) so I guess I’ll just sum it up what I had written and say, I’m thoroughly enjoying your blog. I as well am an aspiring blog writer but I’m still new to the whole thing. Do you have any points for novice blog writers? I’d definitely appreciate it. Great web site. A lot of useful info here. I’m sending it to some friends ans also sharing in delicious. And certainly, thanks for your sweat! It is in point of fact a great and helpful piece of information. I’m happy that you just shared this helpful info with us. Please stay us informed like this. Thanks for sharing. You completed several fine points there. I did a search on the subject and found a good number of persons will go along with with your blog. Hello, Neat post. There’s a problem together with your website in internet explorer, would check this?K IE nonetheless is the market chief and a good component to people will omit your wonderful writing due to this problem. I don’t even know how I ended up here, however I assumed this publish used to be great. I do not recognize who you’re however definitely you’re going to a well-known blogger if you aren’t already Cheers! I am glad to be a visitor of this consummate web site! , regards for this rare information! . Woah! I’m really digging the template/theme of this blog. It’s simple, yet effective. A lot of times it’s challenging to get that “perfect balance” between usability and visual appeal. I must say that you’ve done a very good job with this. Also, the blog loads super fast for me on Chrome. Superb Blog! I have been checking out some of your stories and i must say nice stuff. I will surely bookmark your website. Wow, amazing blog structure! How lengthy have you ever been blogging for? you make blogging glance easy. The entire glance of your web site is great, as well as the content! But wanna remark that you have a very nice internet site, I enjoy the style and design it actually stands out. You completed a few nice points there. I did a search on the subject and found a good number of people will agree with your blog. What’s Happening i am new to this, I stumbled upon this I’ve discovered It positively useful and it has aided me out loads. I hope to contribute & aid different customers like its helped me. Great job. Really informative and superb complex body part of articles, now that’s user pleasant (:. My wife and i have been so fortunate Albert could deal with his investigations with the ideas he made through the weblog. It is now and again perplexing to simply always be giving out tips and tricks that many men and women have been trying to sell. And we also remember we’ve got the blog owner to thank for that. The main explanations you have made, the easy website navigation, the relationships you can make it easier to foster – it is everything exceptional, and it is letting our son in addition to the family know that this idea is amusing, and that is really vital. Many thanks for all! You really make it appear really easy along with your presentation but I in finding this matter to be actually one thing that I believe I might by no means understand. It sort of feels too complex and extremely wide for me. I’m looking ahead to your subsequent put up, I’ll try to get the hang of it! Good day very cool web site!! Guy .. Beautiful .. Amazing .. I’ll bookmark your blog and take the feeds additionally…I’m happy to seek out so many useful info here in the publish, we’d like develop more techniques on this regard, thanks for sharing. . . . . .
Have you ever considered publishing an e-book or guest authoring on other websites? I have a blog centered on the same topics you discuss and would really like to have you share some stories/information. I know my audience would enjoy your work. If you are even remotely interested, feel free to shoot me an email. Hiya very nice web site!! Guy .. Excellent .. Wonderful .. I will bookmark your web site and take the feeds also?KI am satisfied to find a lot of helpful info right here within the put up, we need develop more strategies in this regard, thanks for sharing. . . . . .
Hi my friend! I want to say that this article is amazing, great written and include approximately all vital infos. I would like to see extra posts like this . Thank you for sharing superb informations. Your web-site is very cool. I am impressed by the details that you have on this site. It reveals how nicely you perceive this subject. Bookmarked this website page, will come back for more articles. You, my pal, ROCK! I found simply the info I already searched all over the place and just could not come across. What an ideal web-site. Hi would you mind letting me know which web host you’re utilizing? I’ve loaded your blog in 3 different web browsers and I must say this blog loads a lot quicker then most. Can you suggest a good web hosting provider at a honest price? Thanks a lot, I appreciate it! Good post. I be taught one thing more difficult on completely different blogs everyday. It’ll all the time be stimulating to learn content from other writers and practice just a little something from their store. I’d choose to use some with the content material on my blog whether or not you don’t mind. Natually I’ll offer you a hyperlink in your web blog. Thanks for sharing. Hello there, just was alert to your weblog thru Google, and found that it’s truly informative. I am going to watch out for brussels. I’ll appreciate when you continue this in future. Many other folks can be benefited out of your writing. Cheers! I do consider all of the ideas you’ve offered for your post. They are very convincing and will definitely work. Still, the posts are too quick for beginners. May you please lengthen them a little from next time? Thank you for the post. I have to express some appreciation to you for rescuing me from this predicament. Because of looking out throughout the the web and meeting solutions which were not powerful, I thought my entire life was gone. Being alive without the presence of strategies to the issues you have fixed by means of the short post is a crucial case, and the kind that would have badly affected my career if I hadn’t discovered the website. Your personal talents and kindness in playing with everything was helpful. I am not sure what I would have done if I hadn’t discovered such a subject like this. I can also at this moment look forward to my future. Thank you so much for the high quality and sensible help. I will not think twice to endorse the blog to any person who needs care about this subject matter. Hello.This article was extremely motivating, particularly since I was searching for thoughts on this topic last Friday. Great V I should definitely pronounce, impressed with your site. I had no trouble navigating through all the tabs as well as related info ended up being truly easy to do to access. I recently found what I hoped for before you know it at all. Quite unusual. Is likely to appreciate it for those who add forums or something, site theme . a tones way for your client to communicate. Nice task..
Hi! I know this is kinda off topic however I’d figured I’d ask. Would you be interested in exchanging links or maybe guest writing a blog post or vice-versa? My site covers a lot of the same subjects as yours and I think we could greatly benefit from each other. If you’re interested feel free to shoot me an email. I look forward to hearing from you! Fantastic blog by the way! Thank you for sharing excellent informations. Your web-site is so cool. I’m impressed by the details that you have on this website. It reveals how nicely you perceive this subject. Bookmarked this web page, will come back for more articles. You, my friend, ROCK! I found simply the information I already searched everywhere and simply could not come across. What an ideal site. Howdy! Quick question that’s completely off topic. Do you know how to make your site mobile friendly? My blog looks weird when viewing from my apple iphone. I’m trying to find a template or plugin that might be able to resolve this problem. If you have any recommendations, please share. Many thanks! You have observed very interesting details! ps nice site. “I just wish we knew a little less about his urethra and a little more about his arms sales to Iran.” by Andrew A. Rooney. In the grand design of things you secure a B- for effort and hard work. Exactly where you misplaced me personally was first on all the facts. As they say, the devil is in the details… And that could not be more accurate in this article. Having said that, let me inform you just what did give good results. Your article (parts of it) is actually very persuasive and that is most likely the reason why I am making the effort to opine. I do not really make it a regular habit of doing that. 2nd, even though I can easily see a leaps in reasoning you come up with, I am not certain of just how you appear to unite your details which inturn produce your final result. For the moment I shall yield to your point but wish in the future you connect your dots better. Fantastic web site. Plenty of useful info here. I?¦m sending it to a few pals ans additionally sharing in delicious. And obviously, thanks to your sweat! Hey I am so delighted I found your blog page, I really found you by accident, while I was browsing on Bing for something else, Anyways I am here now and would just like to say cheers for a incredible post and a all round exciting blog (I also love the theme/design), I don’t have time to read it all at the moment but I have saved it and also included your RSS feeds, so when I have time I will be back to read a great deal more, Please do keep up the superb work. Spot on with this write-up, I actually suppose this website needs way more consideration. I’ll probably be again to read way more, thanks for that info. This internet site is my inhalation, really great design and style and perfect written content. I?¦ve been exploring for a little for any high-quality articles or weblog posts on this kind of area . Exploring in Yahoo I ultimately stumbled upon this website. Reading this information So i am satisfied to exhibit that I have an incredibly excellent uncanny feeling I found out exactly what I needed. I so much no doubt will make sure to don?¦t forget this web site and give it a look on a continuing basis. What’s Going down i’m new to this, I stumbled upon this I have found It positively helpful and it has aided me out loads. I hope to give a contribution & help other customers like its aided me. Good job. Of course, what a magnificent website and illuminating posts, I definitely will bookmark your website.All the Best! Wow, fantastic weblog layout! How long have you ever been running a blog for? you made running a blog look easy. The total look of your website is fantastic, as smartly as the content material! We’re a group of volunteers and starting a brand new scheme in our community. Your website offered us with useful info to paintings on. You’ve performed a formidable task and our whole community will probably be grateful to you. Good day very cool web site!! Guy .. Excellent .. Wonderful .. I will bookmark your site and take the feeds additionallyKI’m happy to search out numerous helpful info here within the post, we’d like work out more techniques on this regard, thanks for sharing. . . . . .
Hey There. I found your blog the usage of msn. This is an extremely neatly written article. I will make sure to bookmark it and return to learn extra of your helpful info. Thank you for the post. I’ll definitely comeback. I would like to express my admiration for your kind-heartedness giving support to folks that have the need for help with this particular matter. Your personal dedication to getting the solution all over appeared to be remarkably significant and has specifically made professionals much like me to get to their pursuits. Your entire warm and helpful advice signifies much to me and somewhat more to my office colleagues. Thanks a ton; from each one of us. That is very fascinating, You are a very skilled blogger. I’ve joined your feed and sit up for looking for extra of your excellent post. Additionally, I have shared your web site in my social networks! You actually make it seem so easy together with your presentation but I to find this topic to be actually something that I think I might never understand. It seems too complicated and extremely extensive for me. I’m looking forward to your subsequent publish, I will try to get the grasp of it! 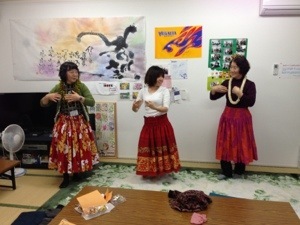 I am glad to be a visitor of this staring weblog! , thankyou for this rare info ! . Wonderful goods from you, man. I have understand your stuff previous to and you’re just too fantastic. I really like what you have acquired here, certainly like what you are stating and the way in which you say it. You make it enjoyable and you still care for to keep it wise. I can’t wait to read far more from you. This is actually a tremendous web site. A person necessarily lend a hand to make significantly posts I’d state. This is the first time I frequented your website page and thus far? I amazed with the research you made to create this actual submit extraordinary. Fantastic process! Hey! I just wanted to ask if you ever have any trouble with hackers? My last blog (wordpress) was hacked and I ended up losing several weeks of hard work due to no data backup. Do you have any methods to protect against hackers? I am no longer certain the place you’re getting your information, however great topic. I must spend a while finding out more or figuring out more. Thanks for great information I was in search of this information for my mission. Hello my family member! I want to say that this post is awesome, nice written and include approximately all vital infos. I’d like to look extra posts like this. of course like your website however you have to check the spelling on quite a few of your posts. A number of them are rife with spelling problems and I in finding it very troublesome to inform the reality nevertheless I will certainly come back again. Good post. I study something more challenging on different blogs everyday. It would at all times be stimulating to read content from different writers and observe a bit of one thing from their store. I’d desire to make use of some with the content material on my blog whether you don’t mind. Natually I’ll offer you a link on your internet blog. Thanks for sharing. Nice post. I used to be checking continuously this weblog and I’m impressed! Extremely helpful info specifically the closing part I handle such information a lot. I used to be looking for this certain information for a very long time. Thanks and best of luck. I truly enjoy examining on this website, it has got good blog posts. “One should die proudly when it is no longer possible to live proudly.” by Friedrich Wilhelm Nietzsche. You are my inhalation, I possess few blogs and infrequently run out from post . “Yet do I fear thy nature It is too full o’ the milk of human kindness.” by William Shakespeare. You actually make it appear so easy with your presentation but I in finding this matter to be really something which I think I might never understand. It seems too complex and extremely wide for me. I’m having a look forward for your next post, I¦ll attempt to get the dangle of it! Rattling good visual appeal on this website , I’d rate it 10 10. I am typically to running a blog and i really recognize your content. The article has really peaks my interest. I am going to bookmark your website and preserve checking for brand spanking new information. Valuable info. Fortunate me I found your web site unintentionally, and I’m surprised why this accident did not came about earlier! I bookmarked it. Hey, I think your website might be having browser compatibility issues. When I look at your blog site in Opera, it looks fine but when opening in Internet Explorer, it has some overlapping. I just wanted to give you a quick heads up! Other then that, great blog! You actually make it appear really easy together with your presentation but I to find this topic to be really something that I feel I might by no means understand. It sort of feels too complicated and very broad for me. I am looking ahead to your subsequent post, I will attempt to get the dangle of it! Just desire to say your article is as amazing. The clarity in your post is just cool and i could assume you are an expert on this subject. Fine with your permission allow me to grab your feed to keep up to date with forthcoming post. Thanks a million and please carry on the gratifying work. Whats Going down i’m new to this, I stumbled upon this I’ve found It positively helpful and it has aided me out loads. I hope to give a contribution & assist different users like its helped me. Great job. excellent put up, very informative. I ponder why the opposite experts of this sector don’t realize this. You must proceed your writing. I am sure, you’ve a huge readers’ base already! I am extremely impressed with your writing skills as neatly as with the format in your weblog. Is this a paid subject matter or did you customize it yourself? Either way stay up the excellent quality writing, it is uncommon to look a nice weblog like this one today..
Howdy! This is my 1st comment here so I just wanted to give a quick shout out and tell you I really enjoy reading your articles. Can you recommend any other blogs/websites/forums that go over the same topics? Thanks! Hi, Neat post. There is an issue with your website in internet explorer, could test this?K IE still is the market leader and a good element of other people will leave out your excellent writing because of this problem. I am not certain the place you’re getting your information, but good topic. I needs to spend some time finding out much more or figuring out more. Thank you for wonderful info I was on the lookout for this info for my mission. Have you ever thought about publishing an ebook or guest authoring on other blogs? I have a blog centered on the same ideas you discuss and would love to have you share some stories/information. I know my viewers would enjoy your work. If you are even remotely interested, feel free to send me an email. I conceive this website holds some real great info for everyone . “This is an age in which one cannot find common sense without a search warrant.” by George Will. Thanks for a marvelous posting! I truly enjoyed reading it, you happen to be a great author.I will ensure that I bookmark your blog and will come back from now on. I want to encourage that you continue your great writing, have a nice morning! Hi there to all, the contents present at this site are truly remarkable for people knowledge, well, keep up the good work fellows. I’m still learning from you, as I’m improving myself. I absolutely enjoy reading everything that is posted on your site.Keep the aarticles coming. I liked it! I do enjoy the way you have framed this specific difficulty and it does supply us some fodder for thought. Nevertheless, from what I have experienced, I simply just hope when the actual remarks stack on that people keep on issue and don’t embark on a soap box involving some other news du jour. All the same, thank you for this outstanding point and though I can not necessarily go along with this in totality, I value your point of view. Some genuinely good information, Glad I discovered this. “It’s amazing what ordinary people can do if they set out without preconceived notions.” by Charles Franklin Kettering. Hiya, I am really glad I have found this information. Today bloggers publish just about gossips and net and this is actually irritating. A good blog with interesting content, that is what I need. Thanks for keeping this site, I will be visiting it. Do you do newsletters? Cant find it. I¦ll immediately grasp your rss feed as I can not to find your email subscription link or newsletter service. Do you have any? Kindly allow me know in order that I could subscribe. Thanks. I’d need to check with you here. Which isn’t one thing I often do! I get pleasure from studying a submit that can make folks think. Additionally, thanks for allowing me to remark! I’ve been browsing on-line greater than 3 hours lately, but I by no means discovered any attention-grabbing article like yours. It is beautiful price sufficient for me. In my opinion, if all web owners and bloggers made good content as you probably did, the net shall be a lot more helpful than ever before. I simply desired to appreciate you once more. I do not know the things I would’ve made to happen in the absence of the entire ways revealed by you regarding my field. It seemed to be a very depressing problem in my view, but noticing the professional way you handled that forced me to jump for gladness. I am just thankful for your work and even believe you recognize what a great job you are putting in training others with the aid of a blog. I’m certain you have never encountered all of us. Great V I should definitely pronounce, impressed with your web site. I had no trouble navigating through all tabs and related information ended up being truly easy to do to access. I recently found what I hoped for before you know it at all. Quite unusual. Is likely to appreciate it for those who add forums or anything, site theme . a tones way for your customer to communicate. Excellent task..
Hi my family member! I wish to say that this article is amazing, nice written and come with approximately all important infos. I?¦d like to peer extra posts like this . We stumbled over here from a different web page and thought I might check things out. I like what I see so now i’m following you. Look forward to checking out your web page repeatedly. I envy your piece of work, thankyou for all the great posts. You completed various good points there. I did a search on the issue and found nearly all persons will go along with with your blog. I conceive this internet site has some really excellent information for everyone : D.
LIᛕE WHAT DАDDY, TELL US,ТELL US.? Both bboys jumpеd uр and down wanting to know how one can maҝe God happy. I simply wanted to thank you very much again. I do not know what I would’ve implemented in the absence of the methods shared by you regarding such problem. It was actually an absolute difficult difficulty in my view, however , spending time with the very skilled fashion you processed that forced me to jump for happiness. I will be happier for the work as well as have high hopes you are aware of an amazing job that you are carrying out training others thru a blog. More than likely you haven’t come across any of us. You are my intake, I own few blogs and infrequently run out from to post : (. Thank you for sharing superb informations. Your website is very cool. I am impressed by the details that you have on this web site. It reveals how nicely you perceive this subject. Bookmarked this website page, will come back for more articles. You, my friend, ROCK! I found just the information I already searched all over the place and simply could not come across. What a great site. I happen to be writing to make you know what a really good experience my wife’s child went through reading your web page. She figured out several pieces, including how it is like to possess an awesome giving spirit to get many more really easily gain knowledge of selected problematic topics. You really surpassed our own expectations. Many thanks for producing these precious, dependable, educational and also cool tips about that topic to Gloria. I really enjoy studying on this website , it contains great blog posts. “Do what you fear, and the death of fear is certain.” by Anthony Robbins. I used to be suggested this web site through my cousin. I am now not sure whether this put up is written via him as no one else recognise such distinctive approximately my problem. You are amazing! Thanks! Spot on with this write-up, I really assume this website wants rather more consideration. I’ll probably be again to learn rather more, thanks for that info. My brother recommended I may like this website. He used to be entirely right. This post actually made my day. You can not believe just how much time I had spent for this info! Thanks! I am in fact glad to read this webpage posts which consists of lots of valuable facts, thanks for providing these information. Heya i’m for the first time here. I found this board and I to find It really helpful & it helped me out a lot. I’m hoping to present something back and help others such as you helped me. This article is truly a good one it helps new net viewers, who are wishing in favor of blogging.